Rhode Island is overdue in undertaking a comprehensive review of rates it pays private providers of services for adults with developmental disabilities, according to a top official of a healthcare consulting firm who helped develop the existing payment structure seven years ago. “It’s past time,” said Mark Podrazik, president and co-founder of Burns & Associates. He said the firm recommends an overhaul of rates once every five years. Podrazik appeared Nov. 13 before a Senate-sponsored commission which is evaluating the way the state organizes and funds its services for those facing intellectual and developmental challenges. 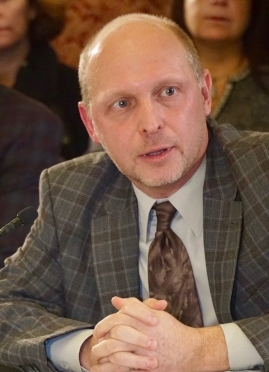 The commission chairman, Sen. Louis DiPalma, D-Middletown, had invited Podrazik to help the 19-member panel gain a deeper understanding of the controversial billing and payment system now in place before it recommends changes intended to ultimately improve the quality of life of some 4,000 adults with developmental disabilities. Burns & Associates was hired by the Department of Behavioral Healthcare, Developmental Disabilities and Hospitals (BHDDH) in 2010 to develop and implement Project Sustainability, a fee-for-service system of payments to hold private providers accountable for the services they deliver and give consumers more flexibility in choosing what they wanted, Podrazik said. In answering questions posed by commission members, Podrazik made it clear that the final version of Project Sustainability was shaped by a frenzy to control costs. The state ignored key recommendations of Burns & Associates intended to more equitably fund the private service providers and to protect the interests of those in the state’s care. Podrazik said that overall, Burns & Associates believed the Division of Developmental Disabilities (DDD) had neither the capacity or the competence implement Project Sustainability at the outset or to carry out the mandates to companion civil rights agreements with the U.S. Department of Justice reached in 2013 and 2014. “I think people were a little shocked” by the new federal requirements to integrate day services in the community and by the question of “who was going to do it,” Podrazik said of the DDD staff at the time. DDD also had an antiquated data system that ill served Project Sustainability and the separate demands for statistics imposed by a federal court monitor overseeing the consent decrees. Podrazik said the aged IT system was the biggest problem faced by Burns & Associates. Between the fall of 2015 and early 2016, Burns & Associates had a separate contract with the Executive Office of Human Services, which asked for advice on cutting supplemental payments to adults with developmental disabilities. While Project Sustainability was supposed to give consumers more choice, the U.S. Department of Justice found just the opposite in a 2013 investigation. DOJ lawyers wrote in their findings that “systemic State actions and policies” directed resources for employment and non-work activities to sheltered workshops and facility-based day programs, making it difficult for individuals to get services outside those settings. At the meeting Nov. 13, Andrew McQuaide, a commission member and senior director at Perspectives Corporation, a service provider, suggested that features of Project Sustainability ostensibly designed to encourage flexibility and autonomy for those using the services functioned in reality as mechanisms to control costs. “We were not hired to cut budgets,” Podrazik said. Going into the project, “we did not know what the budget was” for Project Sustainability. He said Burns & Associates recommended fair market rates for a menu of services under the new plan. For example, it proposed an hourly rate for direct care workers was $13.97. But BHDD refused the consultants’ advice to fight “aggressively” for this level of funding, Podrazik said. With the budget year that began July 1, 2011, BHDDH recommended, and the General Assembly adopted, a rate of $12.03 an hour, nearly two dollars less. “I understood why the department (BHDDH) was doing what they were doing, because they were getting an incredible amount of pressure on the budget – so much so that they were getting their hand slapped when they were over,” Podrazik said. “From the outside coming in, there was a lack of confidence that BHDDH could actually administer a budget that came in on target, so that there was an intense scrutiny to keep the budget intact. It did not help that that they were cut and that there were no caseload increases (in the budget) for multiple years,” Podrazik said. “They were behind the eight-ball before anything was contemplated,” he said. 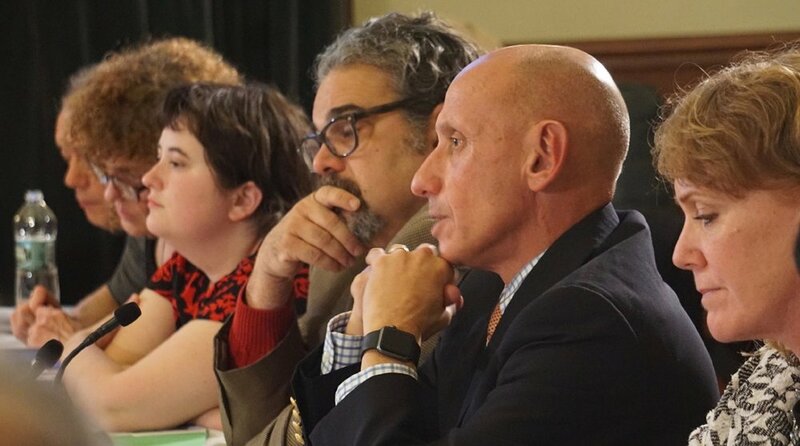 As a legislator, DiPalma said, he has looked at developmental disability service budgets for ten years, and there hasn’t been one that was realistic. “Right,” Podrazik replied, adding that funding for developmental disabilities had been declining from year to year in Rhode Island, even before Burns & Associates was hired for Project Sustainability. “It’s a whole different landscape,” he said. At the time, average per-person cost for a RICLAS client ran about three times more than the average in the privately-run system. All the RICLAS clients could eventually be transferred to private providers, Burns & Associates advised the state. “This recommendation was shut down immediately, with the reason being a protracted fight with the unions,” Podrazik said in prepared remarks. Burns & Associates then recommended lowering the reimbursements to RICLAS. “This was also shut down,” Podrazik wrote. “It was apparent early on that there were funds to be redistributed between RICLAS and the Private DD system, but there was no appetite to do so. It is unclear exactly where this directive was coming from within state government, but that was the directive given” to Burns & Associates, Podrazik wrote. Commission members asked Podrazik whether anyone at Burns & Associates or state government believed that it was possible for private service providers to absorb the rate reductions written into Project Sustainability, given the fact that about half the agencies were already running deficits before the program was enacted. McQuaide quoted from the memo that BHDDH sent the General Assembly in May, 2011, explaining its approach to implementing Project Sustainability. “We did not reduce our assumptions for the level of staffing hours required to serve individuals,” the memo said. “In other words, we are forcing the providers to stretch their dollars without compromising the level of services to individuals,” the memo said. “I don’t know,” Podrazik replied, but he remembered meetings in which participants expressed sentiments similar to the quotation highlighted by McQuaide. Given the budgetary restrictions, Podrazik said, he favored reducing rates rather than cutting back on services or creating a waiting list for services. Podrazik said Burns & Associates was hired to deal with certain problems; not to review services for adults with developmental disabilities top to bottom. Asked to change the assessment used to determine each person’s need for support, Burns and Associates recommended the Supports Intensity Scale, or SIS, and advised it should be administered by an entity “other than the provider or the state to avoid the perception of gaming the system,” he said. The state went forward with the SIS, linked it to funding individual authorizations, or personal budgets for clients, and assigned the administration of the assessment to the state’s own social caseworkers. The fact that the SIS is administered within BHDDH has been criticized by the DOJ and an independent federal court monitor. With federal scrutiny on BHDDH, and numerous complaints from families and providers that the SIS scores were manipulated to cut costs, the department switched to a revised SIS assessment and retrained all its assessors in November, 2016. According to Podrazik, Burns & Associates recommended each client’s funding authorization – or personal budget – be awarded on an annual basis, to allow individuals to plan their lives and providers to look ahead in figuring out expenses. But the state insisted on the option to change reimbursement rates on a quarterly basis as a means of managing costs more closely within a fiscal year. That was the feature of Project Sustainability which enabled BHDDH to impose two consecutive cuts on providers, once on July 1, 2011, and a second time on Oct. 1, 2011. Since then, rates have increased incrementally. At the hearing, Podrazik illustrated the difference between a yearly authorization and a quarterly one in the life of a consumer. “Maybe someone goes away for the month of August,” he said. If that person has a quarterly authorization, the money for services in August reverts to the state. But with an annual authorization, the funding can be used for the person’s benefit during another month of the year. Podrazik agreed with a commission member, Peter Quattromani, CEO of United Cerebral Palsy, that quarterly authorizations compromise the flexibility intended to be part of the design of Project Sustainability. Podrazik said he knows of no other state that makes quarterly authorizations for developmental disability services. DiPalma, the commission chairman, asked if there was any thought given to the impact of a requirement that providers document how each staff person working during the day spends his or her time with clients, in 15-minute blocks. Project Sustainability decreased overhead costs to private providers but did not offset those cuts with allowances for hiring the personnel necessary to process the documentation. “The Rhode Island project wore me down, so I’m working with hospitals these days,” Podrazik said. He said he came back to Rhode Island because DiPalma was very persuasive and because he wanted to “set the record straight” on the involvement of Burns & Associates with Project Sustainability.